This year, Friday February 16th marks the first day of the New Lunar Year! The date changes every year and is based on the Chinese Lunar calendar which uses a 12 year cycle instead of the more familiar Western 12 month cycle. The holiday used to be called Chinese New Year (and still sometimes is), but since the holiday is celebrated among many Asian cultures, it has now become more commonly known as the Lunar New Year, and more recently, the Spring Festival. Despite the fact that most Asian cultures have adopted the Western yearly calendar, Lunar New Year has maintained its status as a culturally significant and historically important annual holiday. The celebrations begin on the eve of the holiday (February 15th this year) and last for 15 days culminating with the magical Lantern Festival. The Lunar New Year is a big gift giving holiday. Gifts that symbolize prosperity and good fortune for the coming year are offered to business associates and extended family alike. Whether you are sending it from afar, or bringing it to your host for a traditional Lunar New Year’s eve reunion dinner, there are some simple rules to follow when choosing an appropriate gift for Chinese New Year. 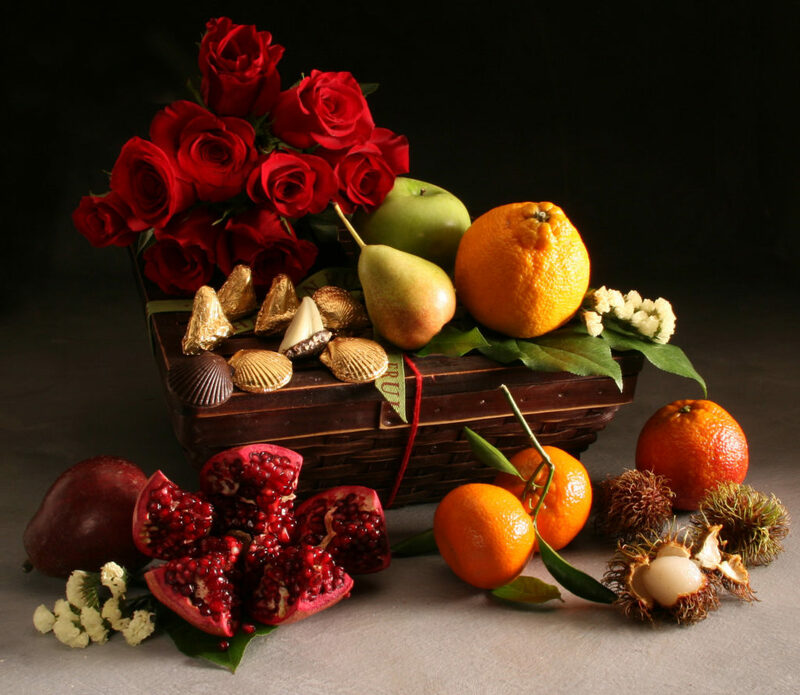 Fruit baskets are time-honored gifts for Lunar New Year. Lucky for Manhattan Fruitier! And luck is what this holiday is all about. 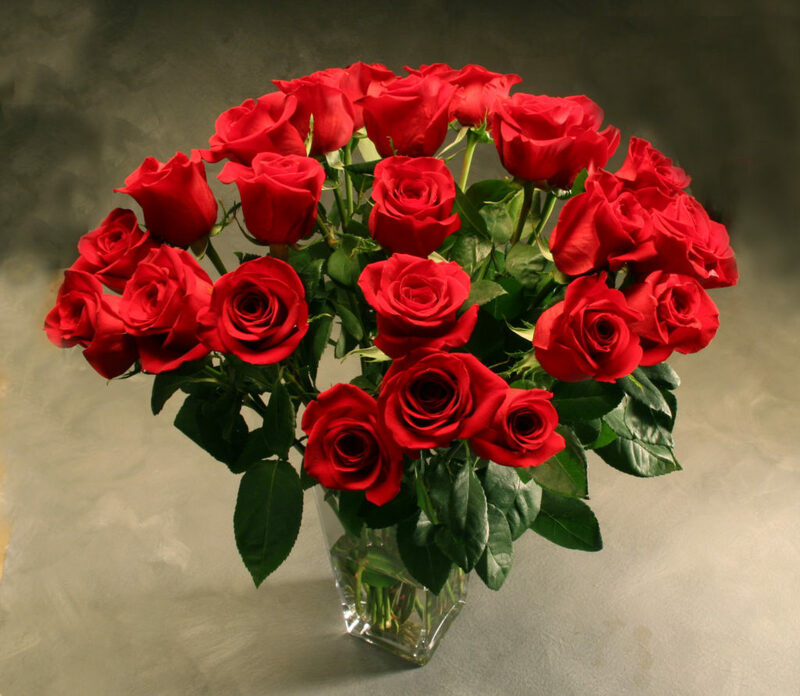 Customary gifts are those that are symbols of good luck, wealth and prosperity. Typically, citrus fruits are given this time of year for several reasons. 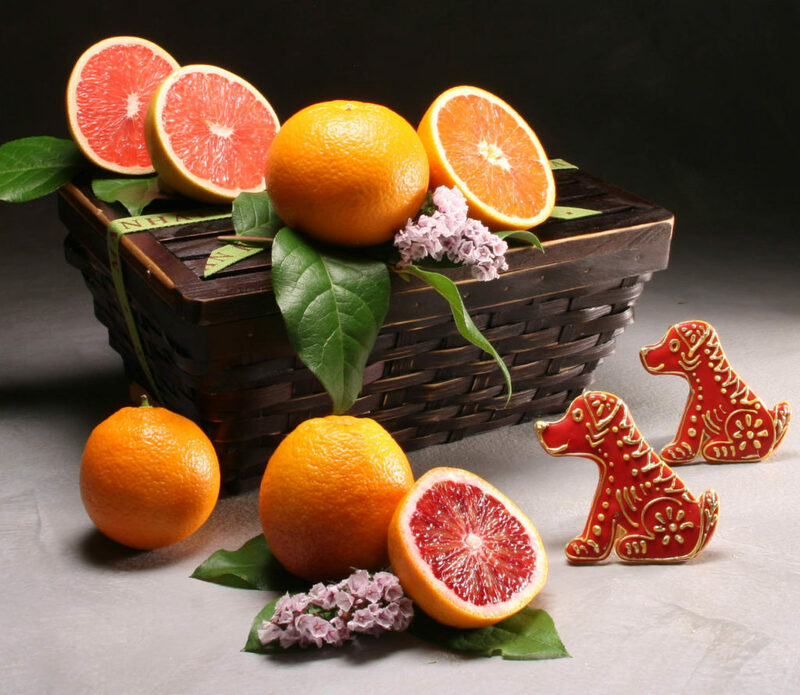 First of all, the Lunar New Year falls during the cold winter months when citrus is the most abundant fruit. Secondly, citrus fruits are round in shape and “gold”en in color: roundness suggests fullness in the belly and the pocket, and having “gold” means having wealth. Finally, the way the names of citrus fruit such as tangerines and oranges are pronounced in Chinese sounds like the same word for “success”. Every year at Manhattan Fruitier we like to create a new Lunar New Year gift that incorporates only propitious fruits along with cookies hand-iced in lucky red and gold colors and made in the shape of the animal of the year: this year, it is the dog, known for its loyalty, sociability, smarts and courage. How adorable is this gift? Traditionally, fruit baskets are displayed on the Lunar New Year dinner table as a kind of centerpiece so a pretty fruit basket filled with symbols of good fortune is a perfect Chinese New Year gift to bring whether for family, friends or business partners! Cash gifts are also common to give on the Lunar New Year. This makes sense as the holiday is all about welcoming wealth. This time of year, shops in Chinatown here in Manhattan are simply overflowing with lucky red envelopes for cash. If it’s wrapped in red it’s more than just the dollar amount: it’s considered lucky money! Make sure the bills are clean and crisp as it would be considered highly disrespectful to give a gift of old or dirty cash. And take care not to use white envelopes: these are reserved for cash gifts given at funerals only. Numbers hold great traditional significance. For example, the number four when spoken is very similar to the word for death in Chinese. So for the lucky Lunar New Year, you will want to avoid giving a monetary gift in an amount that includes the number four. 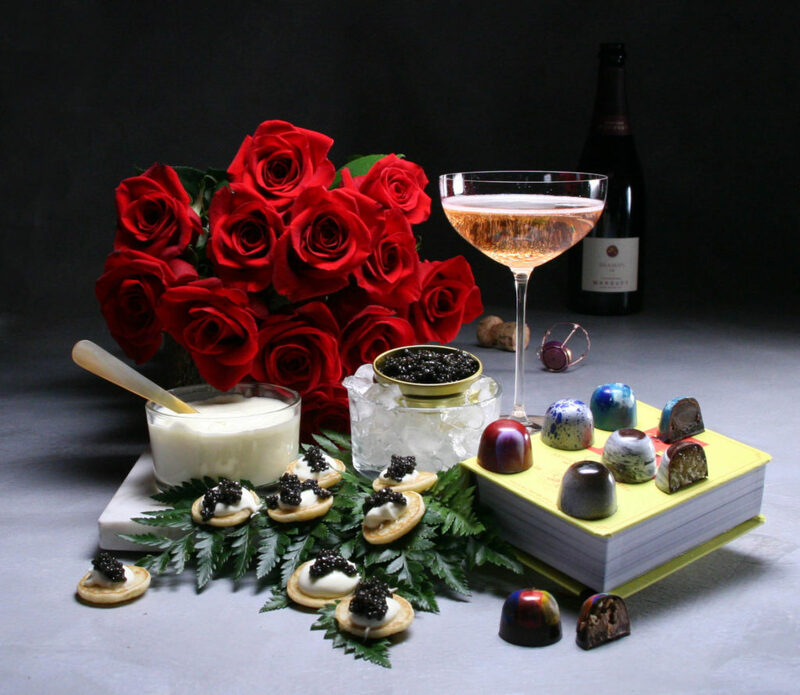 Even numbers are the best bet and since the luckiest number is eight and it is believed that good things come in pairs, it has been suggested that $88 is the perfect amount of money to give if you are going to give cash for a Lunar New Year gift. Among business associates, paying off of any debt incurred during the past year is expected before the Lunar New Year begins. It does not bode well for prosperity if you carry a debt into the New Year, so it is also considered de rigueur to refuse giving a loan to someone you care about. 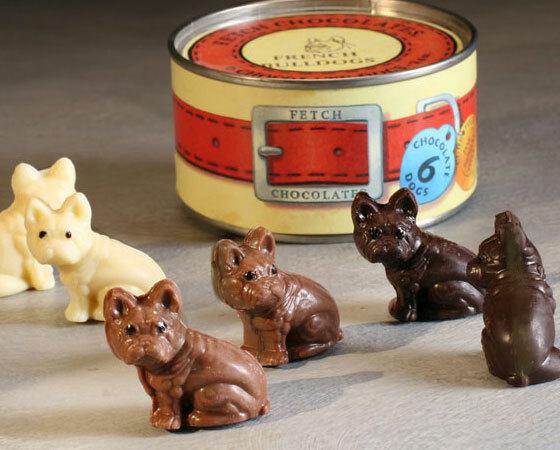 Since 2018 begins the Year of the Dog, it could be a fun idea to send a gift that is sweet and untraditional, but on topic with the Lunar New Year, such as our litter of six chocolate French Bulldog puppies: 2 each of dark chocolate, milk chocolate and white chocolate! Dogs themselves are considered lucky animals to the Chinese. Dogs are faithful companions who will be loyal to you whether you are wealthy or not. One adage is that if a stray dog comes into your home, it is a sign that good fortune is coming soon. So an unexpected gift of chocolate dogs will be welcomed on Chinese New Year! A symbolic gift to give for the Lunar New Year is a proverbial jar full of rice! In Asian culture, a full rice jar connotes affluence and the good fortune to be free from concern about having enough food to eat. During the Lunar New Year celebration, it is important to have food be plentiful as a harbinger of the riches to come. While many modern day kitchens do not have an actual physical jar of rice, the sentiment of this gift for the holiday will not be lost. 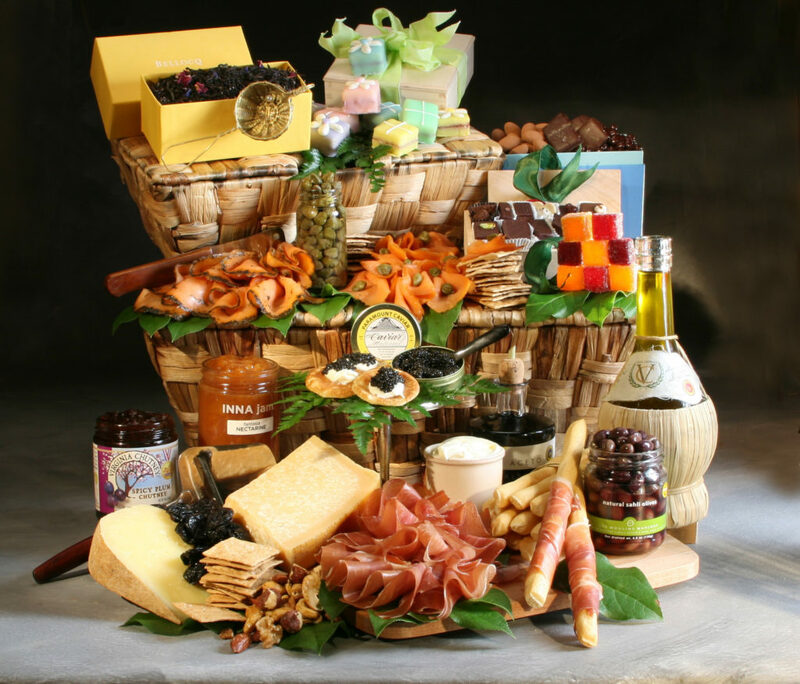 A gift of liquor is also quite common at this holiday, especially among corporate colleagues. Look for the amber-colored spirits and wines in keeping with the belief that gifts of gold color will bring wealth and good fortune. There are so many interesting options available these days with the artisanal spirits trend: whiskeys are more popular than ever! Before giving a gift of wine or liquor, it’s always a good idea to be sure that your recipient drinks alcohol. There are certain gifts that would be considered bad omens to bring into one’s home and should be avoided during the Lunar New Year. For instance, although fruit baskets are customary gifts at this time of year, pears should not be included because the way the word for pear sounds when spoken in Chinese is not auspicious. Scissors and knives are thought to represent the act of slicing apart or splitting and can suggest the severing of a relationship. Also, if you were to cut yourself on the gift, it would bring bad luck for the following year. Clocks symbolize the passing of time and the approach of death, which is not what one wants to bring into their home. Beware about giving a necklace, a tie or a belt as a gift, unless it is to someone you have an intimate relationship with as these items are all things that are believed to bind you together so are usually exchanged only between couples. Colors carry deep meanings in Asian cultures. As I mentioned above, the color white is associated with funerals. Black or blue color signifies death. So when considering a gift for the Lunar New Year, be careful to wrap your present in a lucky color. Red is believed to be a color that scares away evil spirits that bring bad fortune; yellows and golds symbolize wealth and prosperity. So be sure to include these colors in your Lunar New Year gifts and you will clearly communicate the wish you want to bring with the gift you give. In my next blog about the Lunar New Year, I’ll talk about some of the history and holiday traditions of this fascinating ancient celebration. We are never short of delicious apples and pears here at Manhattan Fruitier, but the fall is when we receive crates of new-crop varieties straight from our favorite orchards. 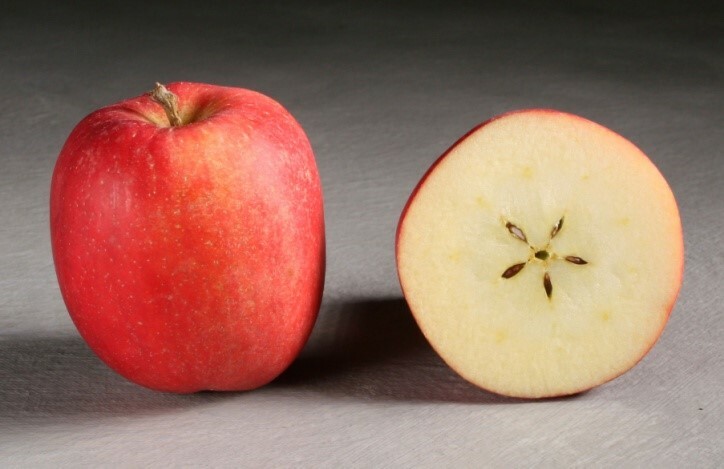 Many apple and pear varieties have been in danger of extinction due to commercial growers seeking more durable types that can sustain long periods in cold storage. 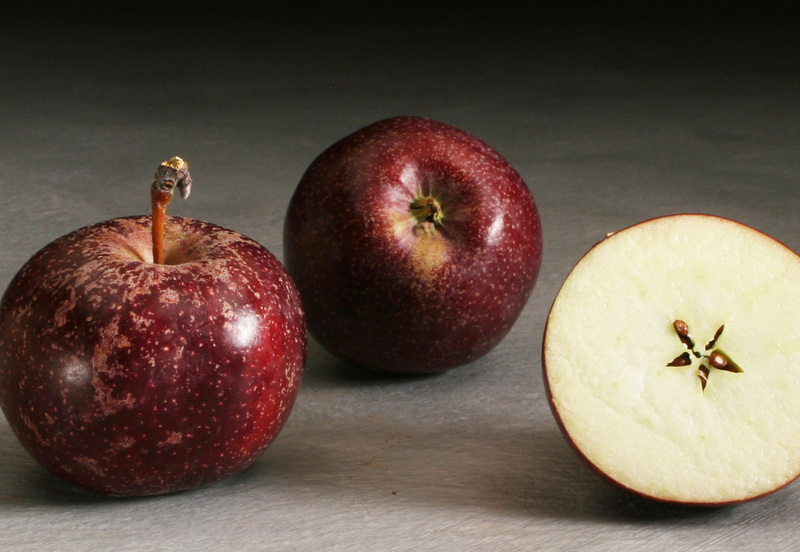 This has led to breeding apples that conform to the model of perfectly round, red and shiny, while casting away the knobby, oddly shaped russet types that are packed with brilliant flavor. Over time this has trained many people to eat with their eyes and not their mouths. We are fortunate to have access to lesser known apple and pear varieties as a few dedicated farmers remain committed to growing these “forgotten fruits” and bringing them to market. 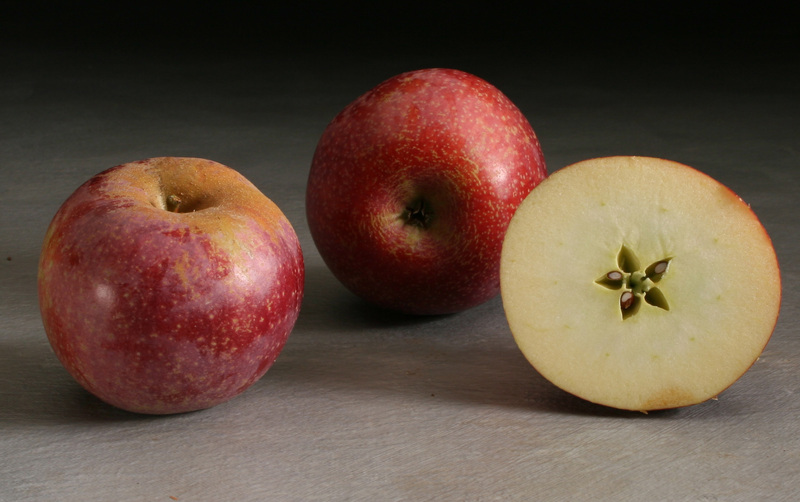 The Zestar apple tastes sweet and tangy, with accents of brown sugar, and is known for its unique flavor. The apple is best used for fresh eating, and for use in a variety of baked goods, sauces, desserts, and salads. 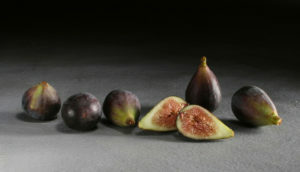 Mollie’s Delicious has a subtle pinkish red skin and exceptionally pleasing taste. 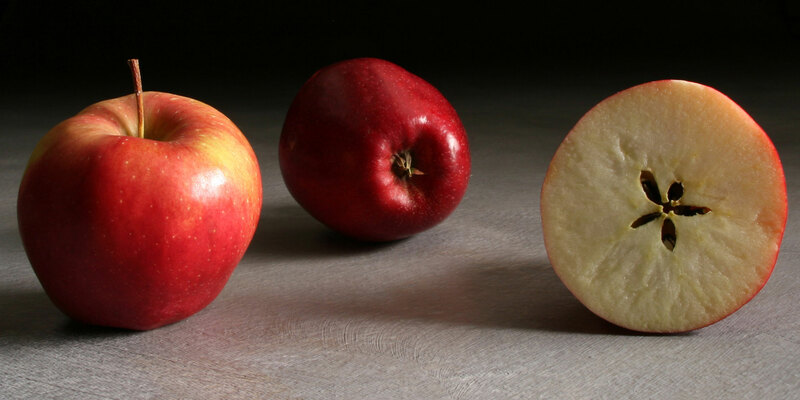 While Mollie’s Delicious has the distinct “bottom bumps” of a Red Delicious, it is not a Red Delicious sport. 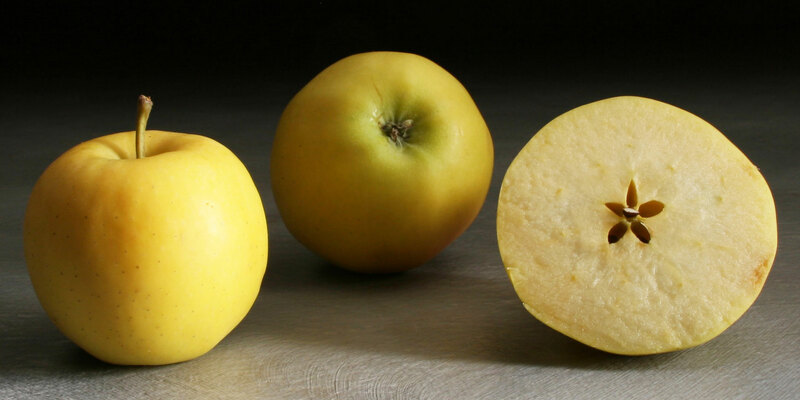 Rather, it is a cross between Gravenstein and Golden Delicious bloodlines. Asian pears have been a staple in our gifts for years, but we’ve recently been swooning over a wonderful varietal grown in New Jersey (of all places). 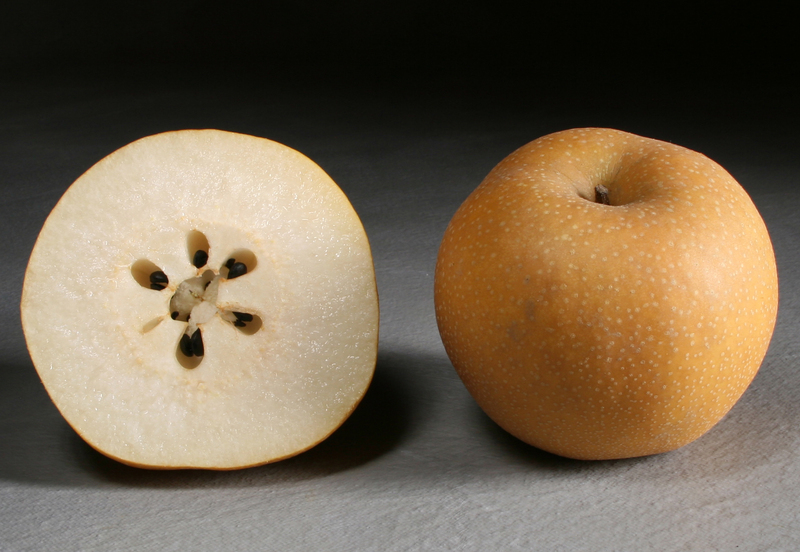 The Shingo pear, grown at Evergreen Farm, is the crispest, sweetest, most mouth-watering pear we have ever eaten. This exceptional Asian pear has pearly white flesh and is subtly sweet and fragrant, juicy and crisp to the bite. Best eaten cold, they explode with a refreshing burst in your mouth. In case you couldn’t tell, we adore this fruit! The Black Oxford is small and quite dark, spattered with rust-colored speckles. The blush is a deep red with purple overtones, almost mahogany, sometimes described as having a blackish bloom. 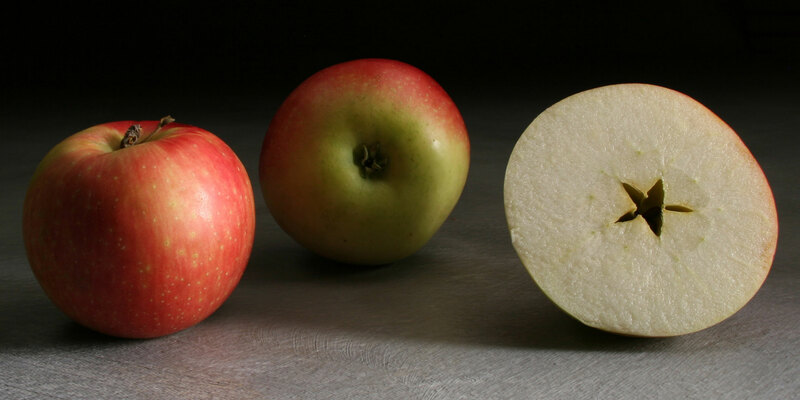 The apple is slightly ribbed and classically shaped, round to conical. Flavor is mild and sweet with a hint of sweet corn, vanilla, and the pure sweetness of cane sugar. The Black Oxford originates from Paris, Maine (Oxford County) about 1790. 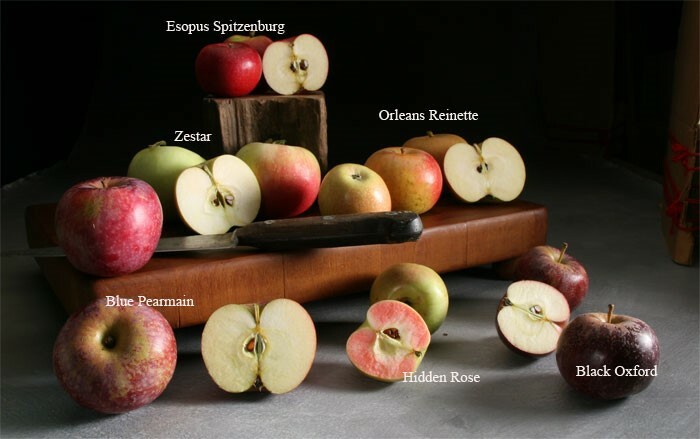 Esopus Spitzenburg originated in Esopus, Ulster County, NY, in the latter part of the 18th century and is reputed to be Thomas Jefferson’s favorite dessert apple. He ordered 12 trees of the variety from William Prince’s Flushing, Long Island nursery in 1790 to plant at Monticello. 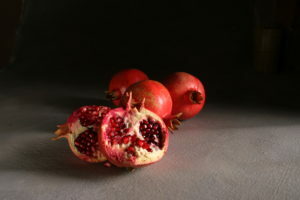 “Spitz” is a large apple, oblong in shape, smooth-skinned and colored a lively, brilliant red, approaching scarlet. It is covered with small yellow specks. 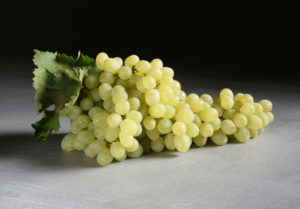 The yellow flesh is rich, juicy, and sprightly. Orleans Reinette is an old-fashioned 18th century French apple with a reputation for good flavor. Over time it has been known by many different names, including Winter Ribston. 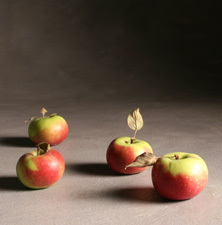 These apples can be found growing in the cooler climate of England as well as Oregon in the United States, and can still be found growing in areas of France. 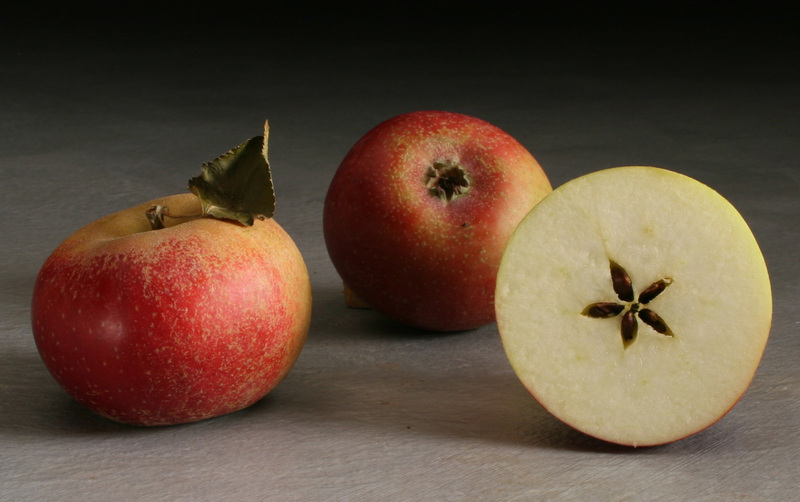 Orleans Reinette apples are medium-sized, plump apples with yellowish-green skin, orange russet, and a red blush. The skin is a rough classic russet texture, and very crunchy. Flavor has hints of sweet oranges and a nutty finish. It goes well with buttery cheeses such as raw milk Swiss-style.